Just like a wood burning stove needs good wood in order to burn hot, the metabolism needs good fuel to burn hot and fast. (First of all, imagine it’s freezing outside) The metabolism is your wood-burning stove. After a long night, the stove needs some logs to get the fire and heat going. After a few hours, you’ll need to put some more wood in the stove to keep it burning hot. But don’t put too much (overeat), because then the fire will suffocate itself, not burning as efficiently…the heat will slow down at that point. But if we keep throwing good wood on the fire every three or four hours, the fire never stops burning hot and fast, until late into our nightly slumber…but then we get up, feel a little chill (hunger), add a log or two to the stove (breakfast), and we’re burning hot again. As your good choices evolve along the way, you’ll realize—like I did, that certain foods (fruits, veggies, lean meats) are like premium wood, perfect for really getting the fire hot—and certain foods (typical junk food fare—The kind that occasionally were a part of my journey in the beginning, because remember—good choices must evolve from what we like and normally eat) are like cold-wet-green wood, the kind that will burn eventually or maybe not, if it does, it’s at a much slower rate—producing less heat. So there you have it, our metabolism is a wood burning stove…perfect analogy, thank you Melissa and Amy! Congratulations Jan! That’s awesome news, keep it up—and soon you’ll be at 155—exactly where you’re headed my friend, and you’ll never want to miss breakfast again—I think you’re already there!! I’m very happy for you! After Saturday morning’s breakfast (an egg white scramble with veggies on a Joseph’s pita), I headed to the YMCA for the hour-long spinning class at 9:15am. This time I knew exactly how long I was “in.” It had been a good long time since I made this a Saturday morning priority, and since I didn’t have a work schedule other than personal projects, it was on! I felt powerful on that cycle, like I could do anything---light-years from where I came. I tried to imagine old Sean doing this, and seriously---that was a ridiculous thought, because 505 pound Sean would have known better than to even try, besides—there’s probably a weight limit on those things. That’s a cool idea—that there really isn’t a weight limit that applies to me at this point, unless it’s made for a child. I like that, oh wow—I really love that! 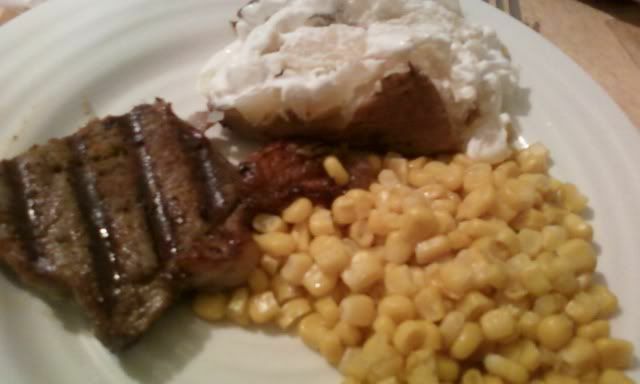 After an amazing steak dinner, featuring a potato AND corn (picture below), I know—double starch---again, not perfect…Never have been, but that plate checked in at 460 calories, well within my calorie budget. I agree, it would have been better with something green—maybe grilled asparagus or fresh frozen green beans. Oh boy, wow---did that become an issue or what? The whole canned green bean debate of 2010. The canned is absolutely full of sodium, unless I try the low or no sodium variety…Hmmm. Well, Just so you know, in my freezer right now, you will find fresh-frozen green beans. I’m looking forward to them immensely! Usually I would just call a one-hour spinning class good enough, and think about my workout for the next day, but not Saturday—No, instead I made my way to the trail for a late night 5K walk/jog, but mostly power walk. I absolutely rocked in the workout department Saturday. I’m so proud! 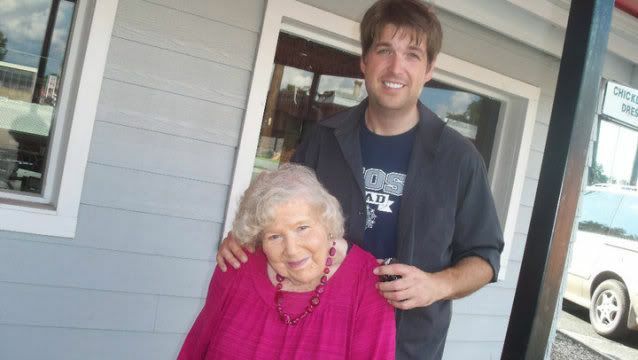 I made my way to Stillwater on Sunday afternoon for a nice visit with mom, grandma, and my Aunt Kelli. Kelli is my aunt, but as I’ve said—we’re only three years apart and were raised like siblings really, so I occasionally refer to her as “sis,” especially on her blog or facebook. The visit was fantastic, absolutely wonderful really…and it wasn’t long before I headed home to immerse myself in thought, as I continue working on other projects. This is what’s so tough about not posting daily. That’s it for Sunday? Really? I did eat well, staying within my calorie budget, but I didn’t workout—opting for a “rest day,” which sounds so permissible and normal, but really---I’m not fooling myself. It only takes 12 minutes to do a set of non-weighted strength training exercises…I could have and should have done at least that. How can I make myself feel better? I worked out twice yesterday! There…I feel better, but not really. 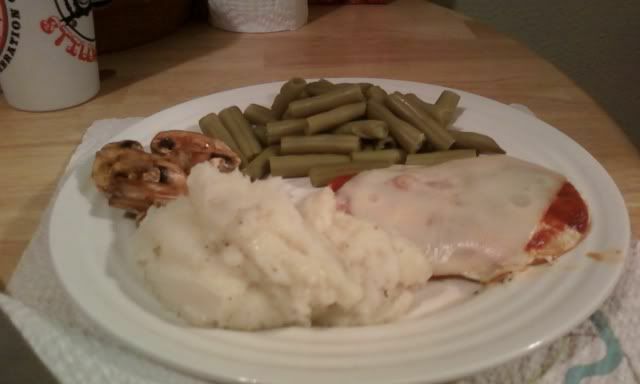 My dinner Monday night after the spinning workout was over the top incredible. I had a little over 700 calories remaining for the day---so I used them with dinner and, get this---desert! See the pictures below!!! Yes my friend, this is what it looks like to lose weight eating real food, in real life, everyday situations. 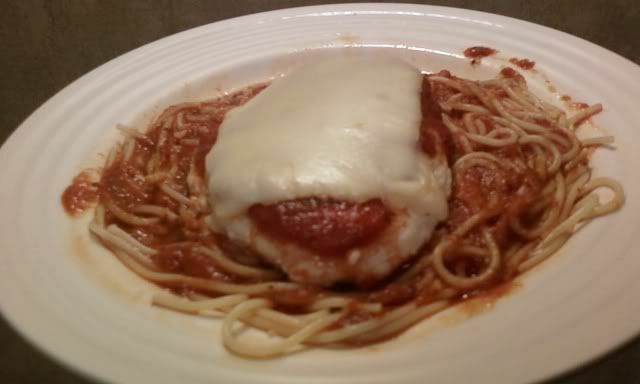 Grilled chicken marinara topped with mozzarella on a bed of spaghetti for the main course---and desert? You ready for this? A deliberately smaller scone…hold on, what does that mean you ask? The scone, made the way the package describes---calls for it to be bigger, by almost double. 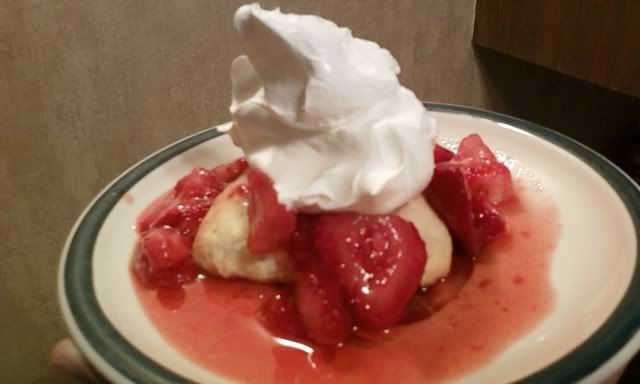 This scone was made smaller with fewer calories, about 120 for the scone, 50 calories for the strawberries and sugar, and another 20 for the Cool Whip Lite---or 190 calories of absolute incredibleness. That’s not a word, I don’t think…maybe it can be, yep—I think so. After I posted a picture of my blood donation, Tammy, a regular reader, sent me a picture of her giving blood!! I just started donating in the last year, as my weight and the resulting high blood pressure always held me back…but Tammy, oh my—she’s been devoted for a long time!!! 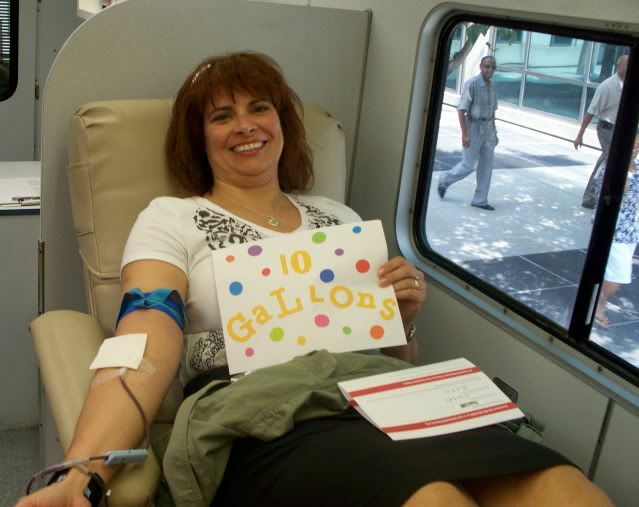 Tammy is a 10-gallon donor and that’s amazing! If you have a picture of you giving the gift of life, please---send it to me and I’ll feature it here. 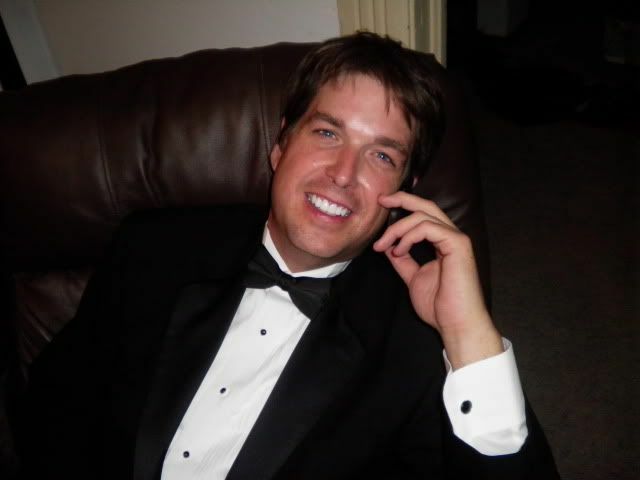 Thank you Tammy for the picture! With my lovely grandmother on Sunday! She’s so beautiful! When she says “Don’t you lose another pound,” I know she says it with love! Breakfast at work…so good! 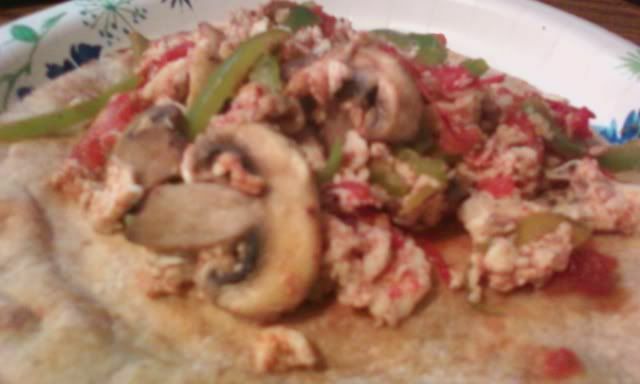 This is two whole eggs with mushrooms on a 60 calorie Joseph’s pita. 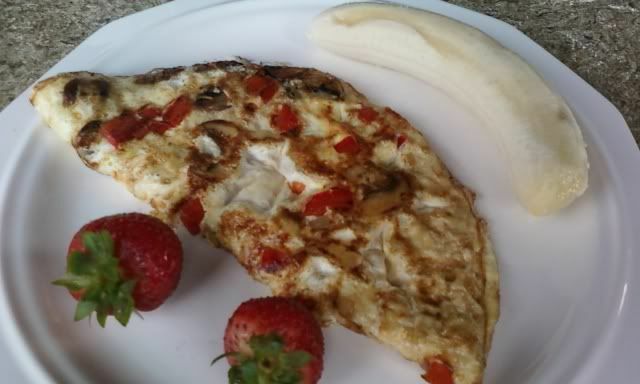 A fantastic 205-calorie breakfast! 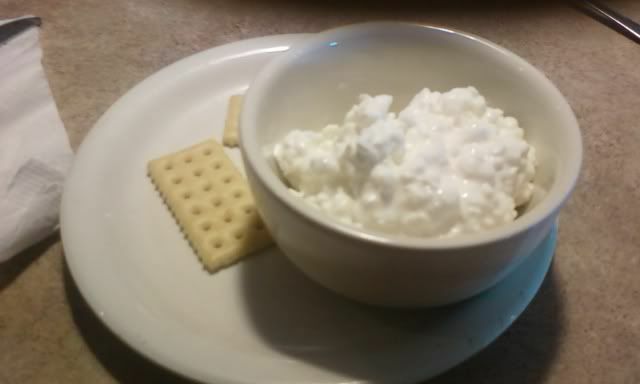 I could have used egg whites instead and added cheese---and had a similar calorie count…just a choice. I can’t think of a better way to spend almost 700 calories (for the entire meal, not just desert). I rarely eat desert, but this was an exception to the rule. It was an amazing calorie value! Today’s featured before picture. 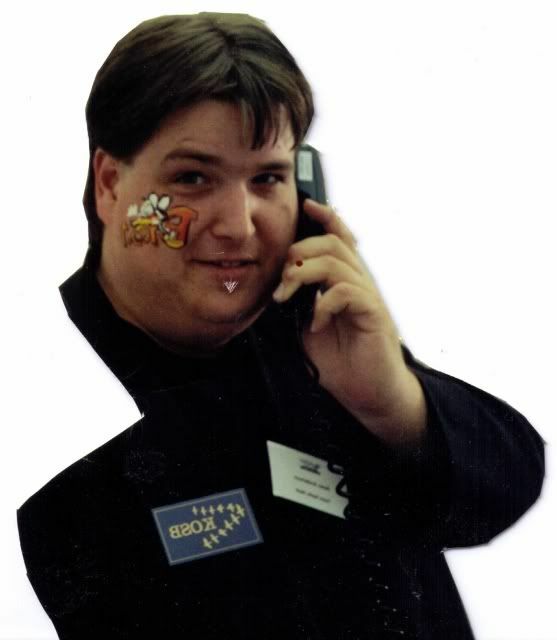 Wow…we would have to make that face painted logo a little smaller today! My sister-in-law is staying the night with us. Irene has several sisters, and this one hasn't seen me in a really long time. I really don't know how to take her reaction to the much smaller me. She was shocked, I mean in total disbelief. She told me I looked great and that she was happy that I was healthier for the effort and then she did something unexpected. She started crying. It wasn't tears of happiness, these were grieving tears. She was grieving the loss of the old me. 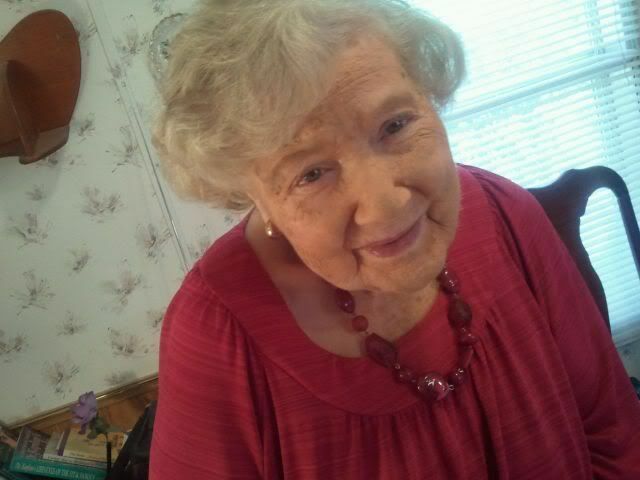 She said “My entire life you've looked the same and now that person is gone.” I assured her that I was still me inside. 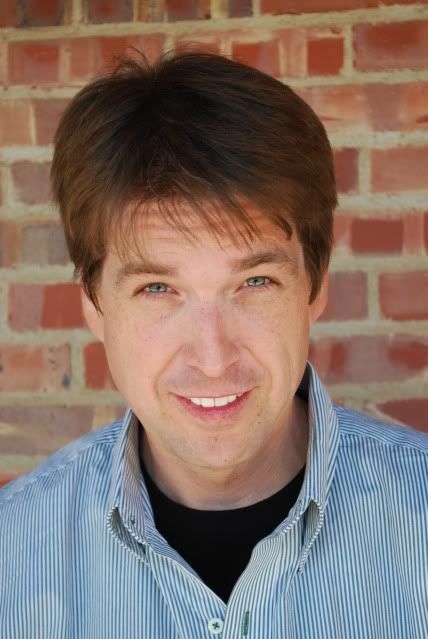 I still have all of the memories, all of the feelings, all of the humor, I'm Sean Anderson, that will never change! She kept wiping away her tears and we hugged, to which she replied “you don't even hug the same.” I guess I didn't realize how much she loved me. It really touched me deeply. I love her too. Judging from her reaction, you would have thought I had died. 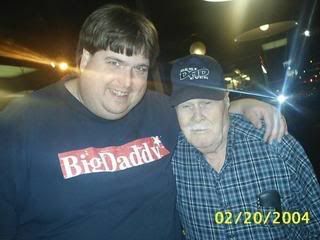 And I explained to her that I would have died in the next five or ten years more than likely, had I stayed at over 500 pounds. She just kept going on about it. She'll never see the old Sean again, and that just devastated her completely. It wasn't the reaction I expected at all. It's really a swim through a giant pool of emotions when I look at my before pictures. I can absolutely relate to the feelings my sister-in-law expressed. I look at those old pictures and I feel sorry for that guy. He's gone. He'll never be back. He'll never walk into the room. He'll never walk onto that stage. That guy died a long time ago. Oh sure, it's still me now, but the presence of that big guy will never return. And I don't want him to come back. He can't. I've completely cut off the mental hangups that gave him a thread of hope on ever returning. I guess we'll just have to get use to it, because I feel amazing---and it keeps getting better and I keep feeling sorry for that big man, but I shouldn't. It might be possible that even at my heaviest, I still loved myself enough to feel a sense of loss now for who I was then. OK---this is getting waaaayyyy too emotional and crazy deep. Let's move on to happy stuff, shall we? 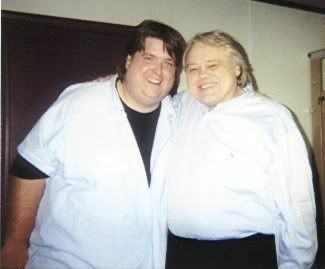 I've lost much more weight since and I have ran into my ex-sister in law a time or two lately. Now, she totally understands---compliments me, but always expresses how she always loved the previous version of me just as well. Her husband also shared that it took him some time to accept my new appearance, but he has, and no longer feels compelled to punch me for no good reason, other than because I (in his words) "look so good." Lucky me. Seriously, the guy's a fighter, I'm not. As I focus more and more on the fundamentals that have brought me this far, I find myself eating mostly at home and my commitment to exercise has increased dramatically this week. Those are both wonderful things! Could I do more? Absolutely. Should I? Of course. Will I? You can bet the farm, yes! 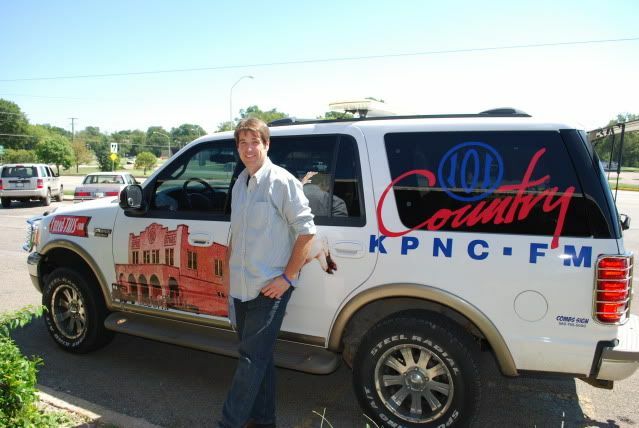 I had remote location broadcasts all day Friday. 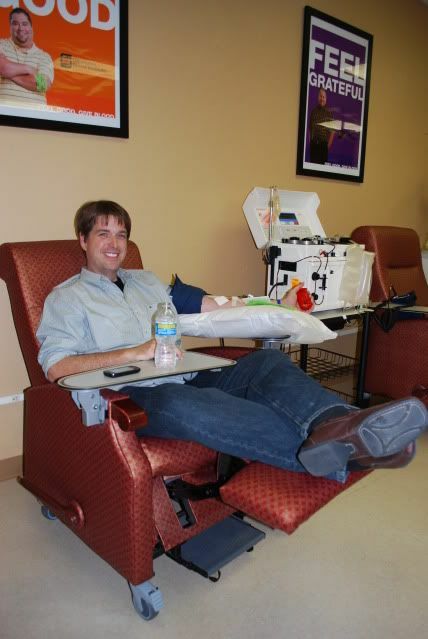 The first was a mid-day broadcast at the Oklahoma Blood Institute, where I gleefully made a double donation of red blood cells. OK, maybe "gleefully" isn't the right word. But, I donated never the less. I actually tried to donate a week ago, but they requested that I wait, so I could do it on the air. The second was at the Davis Moore Auto Group, the local Chrysler-Dodge-Jeep dealership. My vitals were good, real good...and since they run a million test on the blood with every donation, soon I'll once again receive a report on my "numbers." My blood pressure today was 123/82...just a touch higher than the previous 120/78, and my pulse---check this out: 57!!! Athletic, they say! Unbelievable, I say. Cathy Cole, the director of Ponca City Medical Center's Healthy Woman program and the Lose To Win program, for which I've spoken on many occasions, is also an accomplished photographer. She came to my broadcast Friday and did me a wonderful favor in snapping some "current" pictures for this blog and my facebook profile picture. Thank you Cathy! I'm not sure Cathy will mind or not, but I think I'm safe in telling you...she's lost nearly 50 pounds and is beyond excited about where she's headed on her transformation road. She's keeping a strict "Calorie Bank and Trust" account and walking around her beautiful neighborhood every evening with her family and friends. She's found the joy in finding the best calorie values too, getting the most bang for her calorie buck, and in that regard---finding the Joseph's 60 calorie pita. She sent me a thrilling text message from the store upon finding her supply of these pitas that have become a staple in my home over the last year. 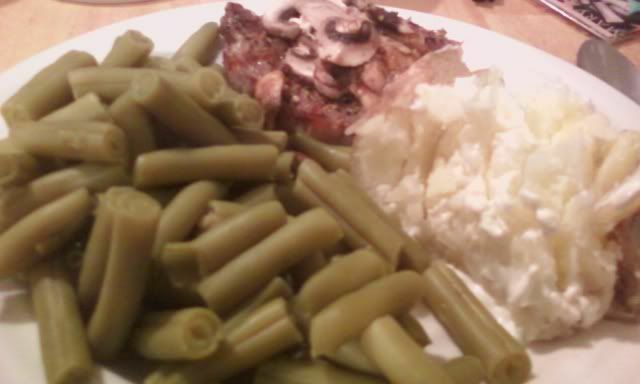 This is a three ounce portion of Rib-Eye steak, an entire 70 calorie can of green beans, and a half a baked potato with a couple of teaspoons of sour cream. The entire meal was just under 450 calories. By the way, the Rib-Eye is possibly the worst calorie value steak out there, but it's also my favorite!! So, I allowed a 3 ounce serving for 220 calories, no problem. A lean sirloin would have given me more meat, but really---I was completely satisfied with my plate. 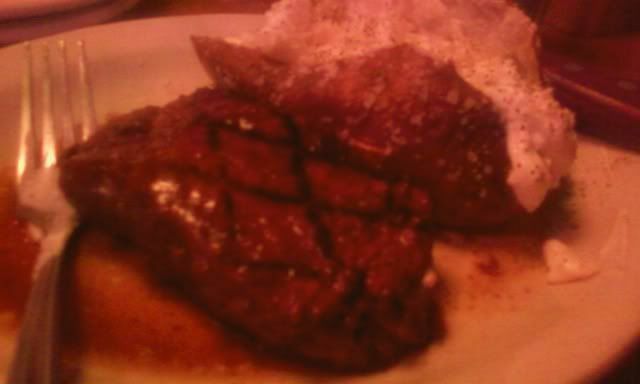 I was full and happy--and I had Rib-Eye steak by golly. I really haven't a clue what this machine does...but they tried to explain. Something about taking extra red blood cells, a double portion (not sure "portion" is the right word unless you're a vampire) and then it replenishes your body with saline--and when it does that part, it feels like ice water is running through your veins...because the saline is room temperature. I don't really have to understand it to know that it saves lives when it's needed in an emergency. I feel like Ricky Bobby. What do I do with my hands? 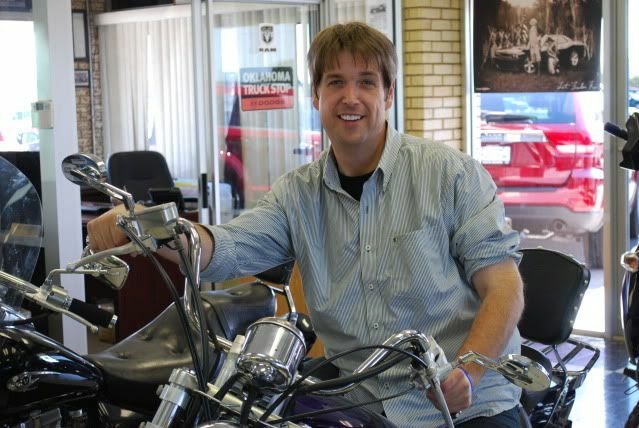 Sitting on a nice motorcycle on the Davis Moore showroom floor. Not to worry my dear sweet mother, but someday--I'd really like to have one of these. 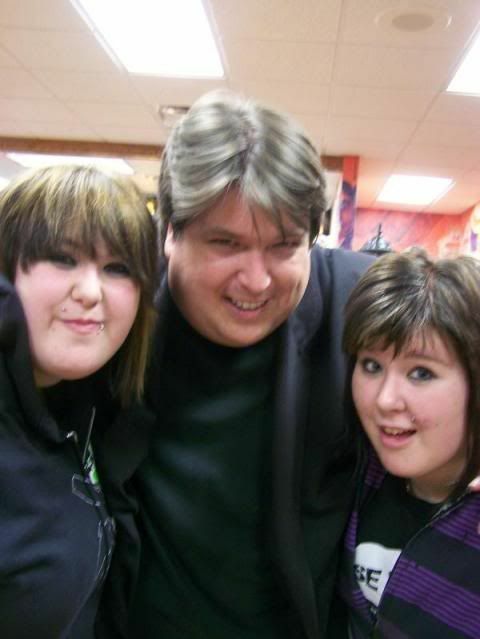 Big before picture with my daughters! 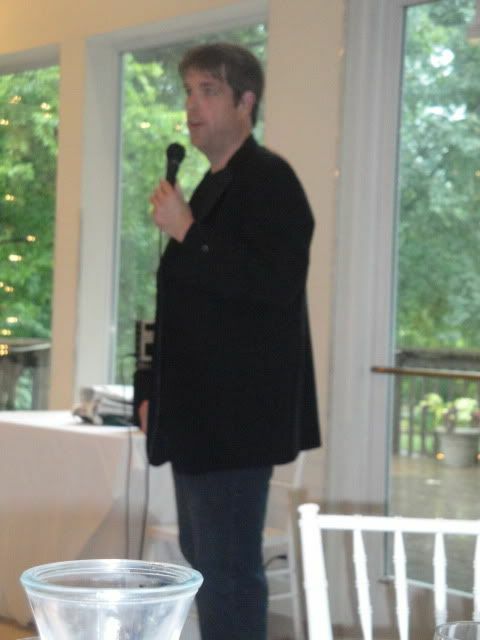 Wearing the black jacket with black undershirt. Apparently, this is a big fashion no-no...at least someone told me it was recently. Really? I never knew. I wonder if Johnny Cash was ever told the same thing? I do agree---a little more color in my wardrobe would be nice. I'm working on that! I'm kind of squinting here because of the sunshine. Thank you Cathy for the pictures!! The spinning class Monday evening felt so wonderful. Deanna, the instructor, incorporated fitness bands...as if pedaling for an hour straight at different resistance levels wasn't enough of a workout! But I must say, it was a great addition to the spinning, brilliant actually. Oh, and the hour---yeah, that's another issue. I didn't get that memo until 42 minutes into what I thought was a 45 minute class. I was beat and so looking forward to stepping off that cycle. When we were on gear 18 and standing up "running" at minute 42, I knew we still had a way to go, and when the classmate on cycle 13 noticed my confusion, they confirmed through ragged breath: "It's an hour today." Really? All of a sudden, I was faced with the thought...17 more minutes instead of a little more than two. But I couldn't bring myself to stop. These people know me...what would they think? I dishonestly felt like I had already achieved an amazing workout at minute 5, it's just gruelling--but in a positive workout kind of way...and look where we were...Hey, I know, I thought...Maybe I have somewhere to be!?! But I didn't, and they would see right through that excuse...not because it would be so hard to believe that I would have somewhere else to be, but because I would have probably climbed off of the bike in dramatic fashion, spilling my water, and announcing over the loud music in an animated fashion, "I have a passion for Putt-Putt meeting to attend, and I wouldn't want to be late..." --But really, I couldn't be happy with myself had I made up something like that. But wow, I was so disappointed. My disappointment was replaced 17 minutes later with an overwhelming feeling of accomplishment. I climbed off the cycle along with all of the other sweaty spinning people and did my best to look all confident too, as if to say, "I was actually hoping it was an hour today, wow--how lucky for me!" Perspective is an interesting study. It's all in our perspective, and sometimes---well, most every time, the difference between us accepting, I mean really understanding or at least appreciating something and being totally foreign to the concept...comes down to a slight shift in our perspective. Or sometimes a major shift is what it takes. Whatever, a shift--you know what I mean. An example I experienced yesterday was very interesting. I was broadcasting on location and communicating with the studios, when this amazing voice came on the line. It was a new board operator who was training to operate my broadcast. The voice I heard would make James Earl Jones seem like Peter Brady. Ok, really---probably not that good--but still, I made him say..."This is CNN." I'm kidding, I really didn't. I did however ask him his age. He told me 17. And then, I asked him how old he was when his voice dropped, and what he said reminded me all about the importance of perspective. With a serious tone he said: "It started when I was eleven years old, and just got worse as I got older." Worse? "Did it hurt?" 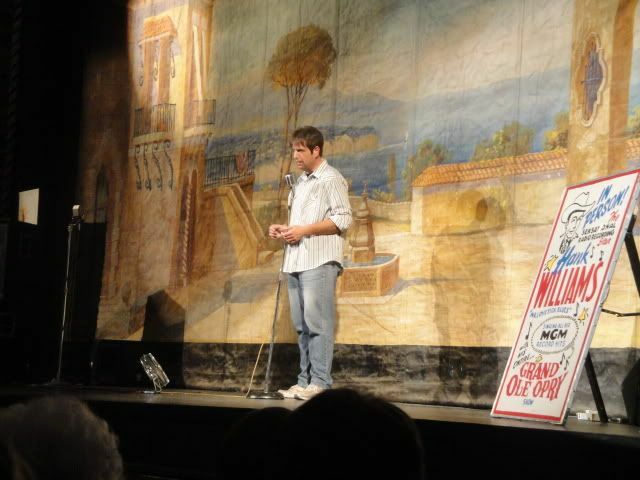 I asked, "No, it just got deeper...everyone made fun of me starting in 7th grade, when they would call me the voice." Wow...wow, wow. He was made to feel different because of a gift that he couldn't fully realize as a gift at the time. What an amazing revelation it will be when he fully realizes that his voice wasn't a curse or a problem at all, and could potentially give him a career in broadcasting and voice-overs. I'm excited to see how he develops as he realizes and appreciates his "unexpected" gift. Perspective, wow...very powerful. It's powerful because we believe whatever others tell us, or even worse, whatever we tell ourselves---for me it goes back to the "mix-tape" analogy from Day 327. I couldn't help but to draw parallels between this kid and me. 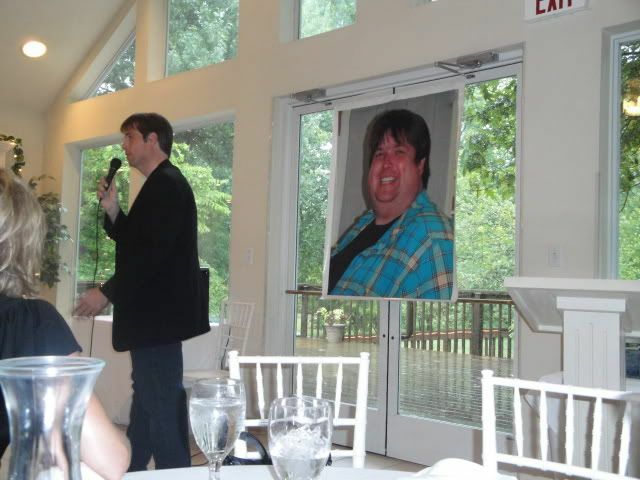 My obesity made me the target of cruelty as a child, like it did for so many of us. And I hated being fat. There was nothing positive, or so I thought. 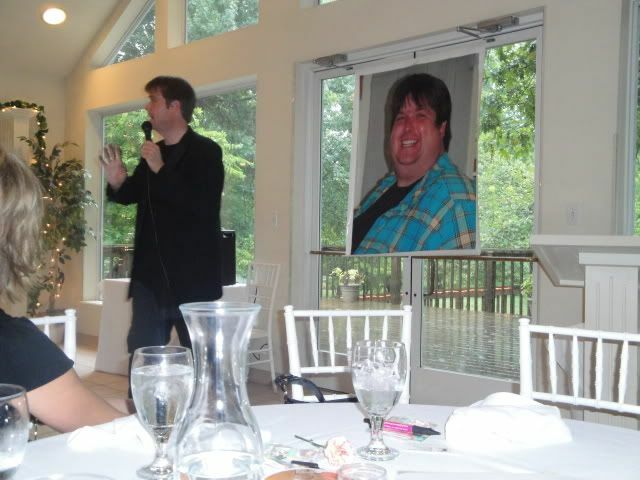 It wasn't until I flipped my perspective on Day 135 with my "Thank You Letter To Morbid Obesity" that I fully understood the power of perspective. And now, it's becoming very clear that, the very thing I thought would be the death of me---has led me to where I am now...and that's a wonderful place. And maybe someday, if he puts in the effort---this kid will realize and enjoy the same unexpected flip in perspective. It's beautiful my friend, it really is beautifully amazing. Speaking of perspective, I had a nice exchange with a reader of this blog through facebook. I'll keep the readers name private because this is a personal subject. But I wanted to share the thoughts with you too because it's an issue many of us face. Facebook friend: Hi...I have a question for ya...since you've lost so much weight, have you had a problem with hanging skin? That's what I'm afraid of...I have about 100 lbs. to lose, have lost 40 so far since last October...kinda wasted my whole summer not working at it. I know I'll more than likely need a tummy tuck, etc. after I lose it all....but would never be able to afford it...so, is there any certain exercises that help? Thanks...and you are an inspiration. Me: It's something that I deal with, absolutely. I knew it would be an issue--how could it not? BUT--I'm healthier now than I've ever been as an adult...so it's still a nice trade. And as hard as it is to accept, I'll never have the underwear model body I dream of having--just too much damage done. And even with surgery someday, the truth is, it still will not be perfect.Here's the deal---I had to lovingly accept my imperfections---and I'm not all the way there, not by a long shot---But I'm working on these issues....and when I look in the mirror these days---I still like what I see, because it's so vastly different and better than where I was for so long.I once used that worry about loose skin to deter my efforts...I'm so glad I identified the craziness of that mental dynamic. Facebook friend: Thank you so much for your response and insight...I think I'll never be extremely happy with what I see in the mirror, but won't let it deter me from working day in and day out to make this change in my life...again, thank you. I have to say, this is the hardest thing to do...getting the weight off and keeping it off...finding the will and strength every day to make it through. Me: You must remember that this is one of the most important things you've ever done. It's about so much more than the physical benefits---you know this, the physical transformation is the least of it...the super important part is our health--physically---and most important--mentally. This freedom from the chains of obesity--that prison, is so incredible to experience. It's like a whole new world---and this loose skin issue is just a scar from my extended sentence. It's all about our perspective. Some call 'em stretch marks, I call 'em battle scars...I'm rather proud of mine. Perspective, it's absolutely life changing. I ended up not completing a 5K Tuesday night. And I honestly didn't feel like it Wednesday night, but I did it anyway. It was a long day on Wednesday. My show started at 6am---and with my live on location broadcast from 3 to 7pm, I wasn't back at the apartment until just after 8pm. I decided to eat dinner and then, as much as I would have rather just collapsed onto my big comfy bed--I put on my jogging pants, grabbed the iPod, and laced up the shoes. Had I not, I could have felt completely justified. After all, it had been an exceptionally long day and I was exhausted. But I'm too important. I stated a personal goal in my last post, and I know: If I'm going to hit that goal, I must return to the same attitude and workout consistency level I had in the very beginning of my long trek down this road. I had to make time for me and that trail. It was a top priority, my "importance level" is set super high---I mustn't forget, ever. Chrissy sent this: Okay Mr. Anderson, since you make this look sooooo easy, question for you. How the heck do you motivate yourself?!? I am a mom, parent club president, work full time, have a house to keep clean and a family to shop and feed. I have a gym membership that sits idle. I am their best client, I pay and do not ever go! How does one make it all work because in my "spare" time I just wanna collapse NOT hit the gym LOL. I need motivation!!!! How did you start yourself off? What jumpstarted you? Chrissy, you must make time for you a priority. It's all about that importance level of yours. I started off knowing that I had to do something now. I knew that I had never been consistent before and further--I knew that this was the reason I always failed. But how? With a very busy schedule--it can seem impossible...back to the perspective issue. I had to decide that this was, I was, important enough to make time---regardless of anything and everything. If I was being totally honest with myself--and I knew I had to be---then I couldn't use my busy schedule as an excuse or permission to fail because, "I'm just so busy." My desire to make this the last weight loss attempt of my life jump started me real good---I honestly felt like I had but one chance remaining...so this time had to be different, because my life--and more importantly---my family, depended on it. 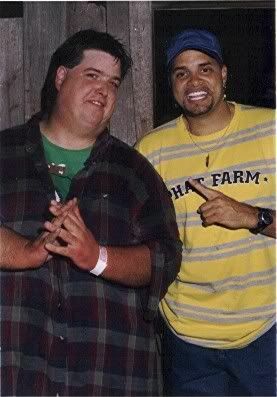 With Sinbad...and he is so genuinely nice by the way, full of wonderful wisdom that guy...Much respect for Sinbad...This was the only time I had a chance to work with and meet him---but he spent nearly an hour talking to me at the after party...telling me everything I needed to know about the business, and by doing that---he was telling me everything I needed to know about him. He's top shelf. What isn't top shelf is the mullet I'm sporting. Wow...that's an impressive mullet if I do say so myself. Eating lasagna. Man, I have to tell you---I LOVE lasagna! I’ve written to the point of eye-rolling exhaustion about how my strong point is the mental aspects of food addiction and my weak points have always been in the workout department. But that really hasn’t been the case…I mean, in the beginning, say—almost the first year, I’d rarely miss a day of doing some kind of productive-deliberate workout. It was just as important as my ability to stay within my calorie budget in any and all situations. Now—things are a little different. I’m only nine pounds from goal, I’m wearing size 36 jeans as I write this entry, and I’m positive I would have been here sooner, had I not allowed myself to become comfortable in my success. I say this—because I know. I know that if I’m going to hit 230 by September 15th, I must step it up to a level where I should have been moving a while back. So what do I do? Well, my food has never been more solid. My choices have evolved naturally and wonderfully—I eat well, good stuff—90% of the time. And whatever I eat, I’ve always been and will remain consistent with my Calorie Bank and Trust. The difference, in my opinion, between me hitting 230 by September 15th or the end of October—is all in my commitment to the kind of consistent workout schedule that catapulted me to losing over 200 pounds the first year. Since Saturday, I’ve completed two 5K’s (one on the treadmill) and a one-hour spinning class. I’ll be doing another 5K Walk/Jog/Sprint Tuesday night and something everyday after. I’ll make sure my water is at least at PEWC levels (64 ounces) everyday—and my experience tells me that with all of this, I’ll hit 230 by September 15th. Personal goal set...let's move! Me--Oh yes Dawn, I've had that problem! It's important to never let the scale dictate your emotions. Our weight can fluctuate for several different reasons, regardless of what we're doing with food and exercise. You must know that what you'r...e doing is right and good, and trust yourself. If you're staying true to your calorie or point budget and you're exercisiing on a regular basis---then you're doing what you need to do---Have faith and keep on, don't be discouraged my friend, the numbers will fall---the transformation will continue. The worst thing you can do is let the scale give you negative emotions. Be proud of what you're doing, be consistent, be honest with yourself---and the results will come--and chances are good---they'll exceed your expectations!! My best to you Dawn---You're doing it wonderfully my friend!! Dawn--I do let the scale control me. I get ANGRY when it doesn't move. I threw one once and cracked it in half. But thanks for the encouragement! I've got just a little bit more to go (I say little bit, but it's 50 lbs) and sometimes it just seems impossible. It WAS 75lbs in April, so I'm getting somewhere! I'll get there and then maybe I'll share it with the world like you have :) Thanks again, Sean!!! Me--You will reach your goal, absolutely!! 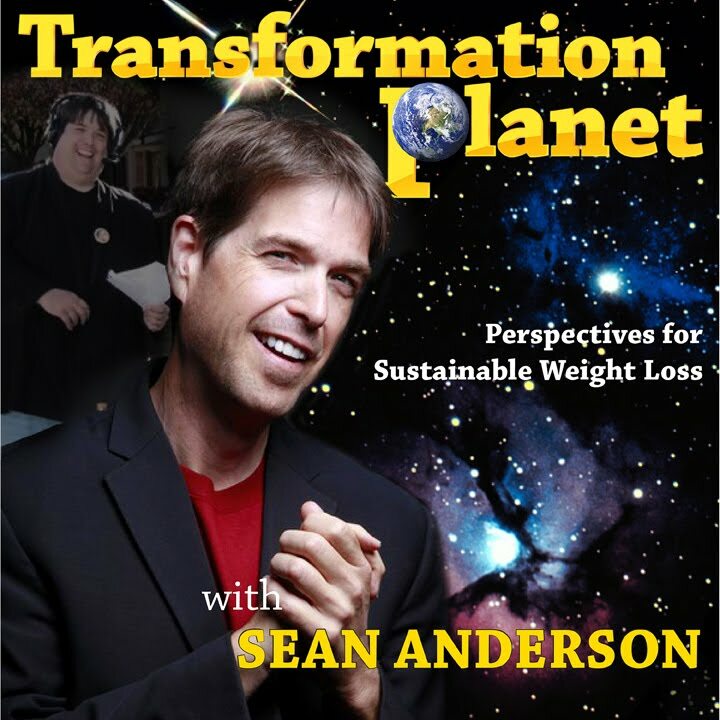 Scale frustrations have ended many weight loss attempts in my past--but when we realize that the complications and frustrations are of our own creation---and you simply focus on the positive of ...your food and exercise choices--it all falls into place, and off! 50 more pounds!! I cheer you all the way!!! And seriously, you're already an inspiration and wonderful example simply by your actions---and you can and will help so many more realize that it's possible. Keep rocking this thing!!! One thing I would add for Dawn--is perhaps adding some calories. Adding some calories to your daily budget, for just a little while, can jump start the metabolism. Elizabeth, there are no set menus. You can eat anything and everything. I do see how that can seem like a scary thought, devoid of any structure or instruction that we’ve always expected and counted on having for a weight loss attempt. But really---if you read my archives, it becomes very clear—that this “nothing is off limits” approach is key for long-term consistent weight loss. It happened after the Tulsa World feature article several months ago and it's happening now with this AOL story. People get the wrong idea about my approach based solely on the headline of the story. The World article listed my "Fast Food Tips and Tricks," and the AOL headline mentions my weight loss "without eating salad." I can't blame the media, it's all information I've supplied them. And it's all true. I don't like salads. But---don't get the wrong idea, because I eat fruits and vegetables--and I'm not on some crazy "fast food diet." I eat what I like and nothing I don't. But what does that mean?My choices had to gradually improve over time. I just knew that if I started forcing myself to eat foods I really didn't like, I would lose weight. What? Yes, I would lose weight, but I would be miserable the entire time, and eventually I would revert to my old habits, my food addiction couldn't tolerate salads or pre-packaged foods too long before I had a meltdown---and I knew that about myself. It was one of the crucial errors I had made in past weight loss attempts. Maybe you're familiar with making that special grocery list, "because tomorrow we're starting!" I decided on Day 1 that I didn't need a special list of foods. I wanted to beat my food addiction---and I knew the only way to do that was face real food, in real everyday real-life situations. That's the reason for my "nothing is off limits" philosophy.This philosophy completely eliminated a couple of things: Feelings of deprivation and feeling like I was cheating. OK---I might be able to do this! I've never felt deprived and I can't feel bad about myself if I eat a serving of potato chips. Here's what happened: My choices started to gradually improve throughout this journey. A mid-day snack in the beginning may have been a 110 calorie pack of Funyuns. Somewhere along the way, that mid-day snack evolved into fresh fruit. 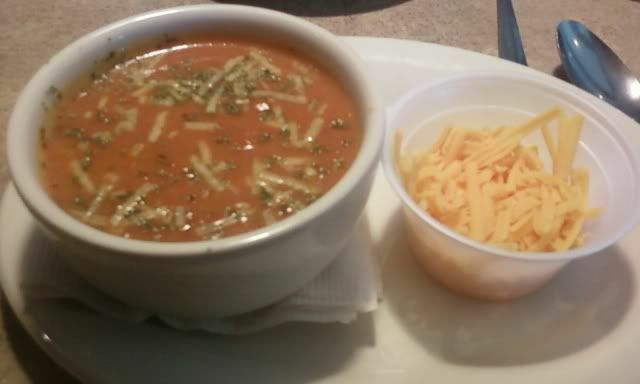 My calorie budget is all about eating normal portions of anything. And since I'm on a budget, I have to make what I call "calorie value" decisions. People still freak out if they see me eating something like a piece of pizza, candy, or even a soft-serve low-fat ice cream cone---because hey, aren't you that weight loss guy? Uh, yeah sure---but what I am more than anything is a normal person. A normal person, eating normal portions of normal food, in normal everyday food situations. If I'm having dinner at your house, there's no need to prepare something special "because we know you're on a diet." I'll navigate my choices in a very normal, very responsible way---with self-honesty about portion sizes and an eye for the best calorie values available at the moment. When I end every blog with "good choices," I'm not saying perfect choices...just good choices. And what that meant on day 1 and what it means today is a little different. The choices evolve in a natural fashion, based on what I like. So my good choices may be different from yours. I like and often enjoy vegetables. I love fruit. I rarely eat fast food these days...all gradual evolutions of my "nothing is off limits" approach. A big salad? Never...and that's ok.
My new blogger feature today belongs to Jen. I read her Day 1 post from last month and it’s filled with apprehension. A clear and certain level of anxiety about sharing her thoughts and experiences along the way. Jen—I completely understand. I encourage people to write, because I know what it’s done for me—without this “writing project,” I doubt I would be where I am today. Never lose focus of why you’re writing. It’s first and foremost for you---to educate you on the behaviors and habits that have brought you to this point. It is also a wonderful tool in discovering where things went wrong before and how to correct them now. 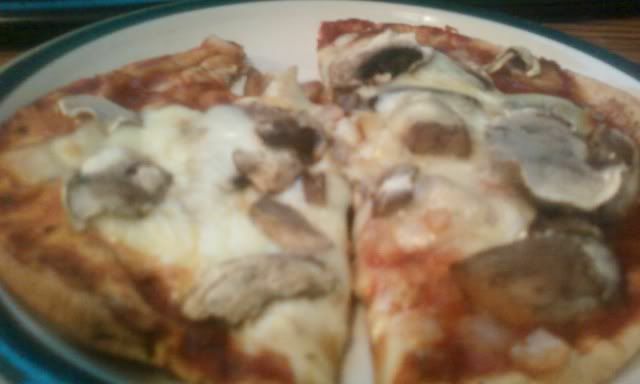 This is a chicken breast and fresh mushroom pita pizza. The entire thing, complete with 75 calories worth of mozzarella and a small sliced grilled chicken breast—checks in at 285 calories. 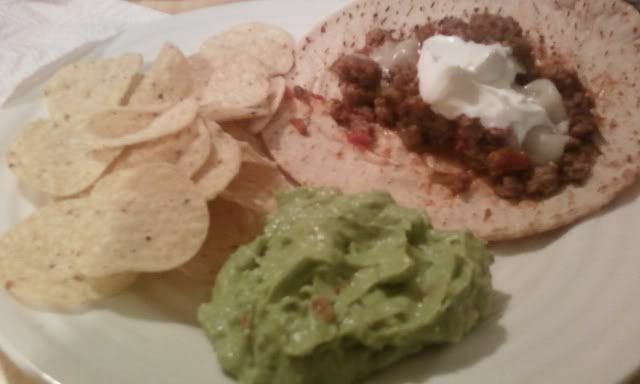 This Mexican dinner—even with a serving of chips and homemade guacamole, plus sour cream on the beef and salsa mixture—checks in at 520 calories. In the beginning of this journey, losing three or four pounds wasn't that big of a deal, now--it makes sense that every pound is noticed! When I weighed four weeks ago--I felt that loss before I ever stepped on the scale. Not only did I feel it, I could see it in the mirror--or better, I couldn't see it...it was gone. Two weeks ago, I allowed my schedule to over-take me---completely missing my weigh-in. So, why didn't I just make it up as soon as possible? Good question! I wasn't "feeling it," I also decided that skipping a weigh-in might be good for me mentally. I don't own a scale and I never will. I refuse to allow the scale to effect my emotions. And although my calorie budget is always on target, my workout schedule isn't, hasn't been in sometime in fact. And this is important: We get what we give. We get what we give! I kept that in mind Friday when I stepped on the scale and found a four pound loss. My official weight: 239 Two Thirty-Nine! I'm in the 230's!!!!!!!! Nine pounds from the goal I set on Day 1. I haven't weighed in the 230's since I was ten or eleven years old. This is big! It had been four weeks since I stepped on the scale...and--I get what I give--So I know--the difference between this being a four pound loss and a seven pound loss can be found in the consistency or lack of in my workout schedule. Regardless, it's all good---I'm just making a valid point. I'm not beating myself up here--But I'm also not rationalizing, in other words---giving myself permission to slack in the workout department because I've done so well along this road. See how we do? It's easy to slip, it's easy to make ourselves feel better about lacking in a particular facet of this journey--we must be able to recognize the truth and move forward with 100% self-honesty. Self-honesty is key along this road--to me, it's the biggest element of success---and without it, we eventually crumble under the weight of the lies we tell ourselves. 100% self-honesty is crucial to your success. I've written about this many times because it's something that I never did before with past failed attempts. Since day one nearly a year ago, this self-honesty policy has been firmly in place, and you know what kind of results I've had. The self-honesty component is vital to the mental changes required on this road to permanent success. Make this one of the most important things you've ever done. Give it the highest important level. Get completely honest with yourself about the habits you know are holding you back---and then get ready for an almost magically transformation of mind and body. Forget “almost,” it is magical. I'm in the home stretch, only nine pounds from goal---266 pounds lost, oh my---that looks, sounds, and feels amazing...anyway, uh---Now, all remaining official weigh days will take place back in Stillwater, Oklahoma at the Payne County Health Department. I will be weighing on the same scales that showed 505 on Day 2. Those scales---wow, I guess you know if you've read the archives...Those scales were the start of more than a dozen attempts at losing this weight. Those scales are very symbolic to me---it's where I started every time. I'd step on, and those blasted scales would give me a bitter dose of reality. Going back will be returning to the scene of 505 reality. Pretending for a moment that these scales could actually think like a person, they probably never imagined I'd actually be successful at losing weight. Well, get ready scales--because I'm coming and I'm bringing over 266 pounds of success with me! When I weigh-in at 230 on that scale, I'll probably cry serious-big tears of joy and triumph. A few readers have asked me lately about the multiple-day post and some have expressed that they miss the daily posting schedule that has been consistent every single day along this road until just recently. I must say, it is very difficult for me to not post everyday, but now it's become necessary. I know, I know---I recently mentioned getting back to daily posting, but now--things have changed in a wonderful way. I've started working on my first book, tentatively titled, "Finding Transformation Road," and if I apply the same consistency in my writing schedule that I applied for the first 22 months of this blog--it'll be finished in a timely manner. So, I'll maintain at least three blog postings per week and spend the rest of the time writing the manuscript. The goal is to have the manuscript to the publisher by Thanksgiving, they'll edit and whatever else they do, and it theoretically could be available by the end of February or early March. I don't like talking too much about my future plans---I'd rather do them first, and then say--Oh by the way---Or better--not say anything at all. I'm not a talker, I'm a doer. But since this blog is called the "Daily..." I find it necessary to explain why it will remain at two to three entries per week. 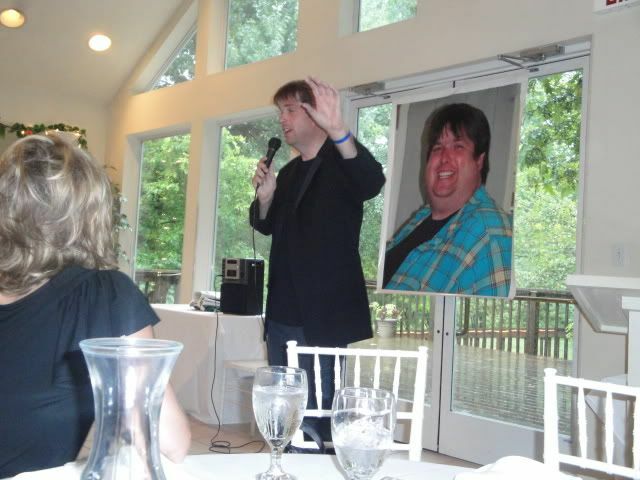 I love to feature fellow weight loss bloggers in these writings. If you've sent me your link recently, and I haven't featured you yet--please send it again: seanboy105@hotmail.com and make sure the word "blog" is in the subject line. 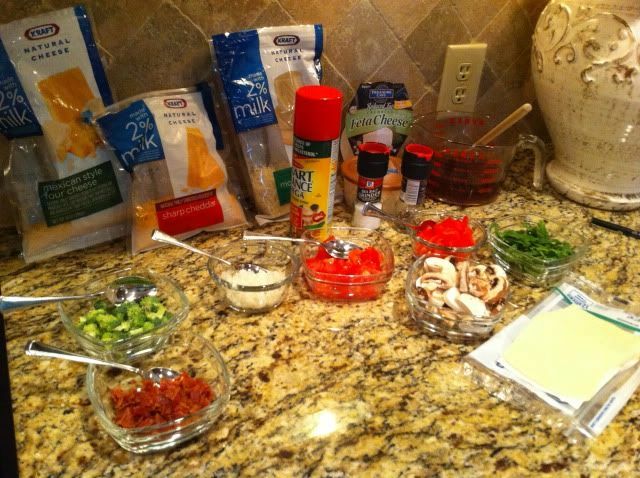 Lucky for me--Kenz took pictures of the omelet making "arena" last Tuesday morning. 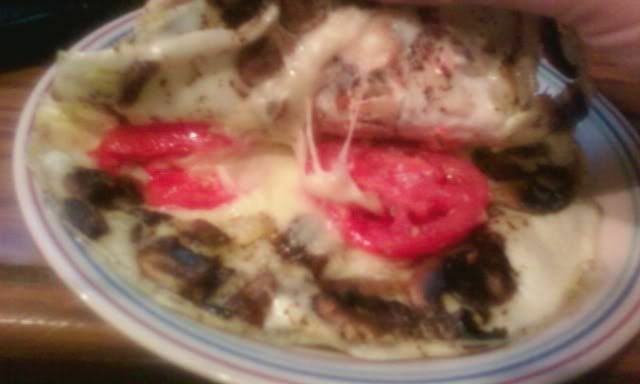 Terry's Italian style omelet--Glad Kenz snapped this---isn't that amazing! It looked absolutely incredible...and very similar in calorie value, compared to my traditional style. My breakfast---either Thursday or Friday morning, can't remember. 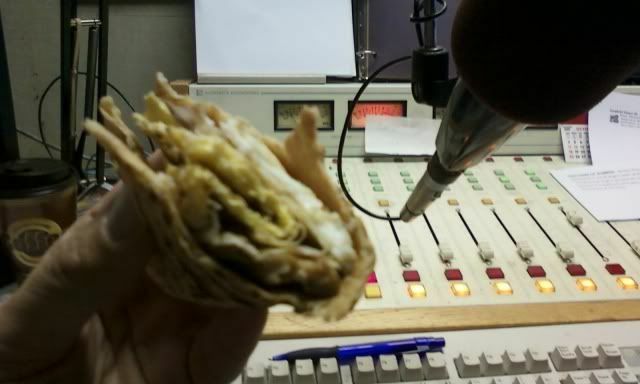 It's two eggs, loaded with veggies, and put inside a folded Joseph's 60 calorie pita with a slice of mozzarella...Hmmm, so delicious--and a fantastic calorie value! 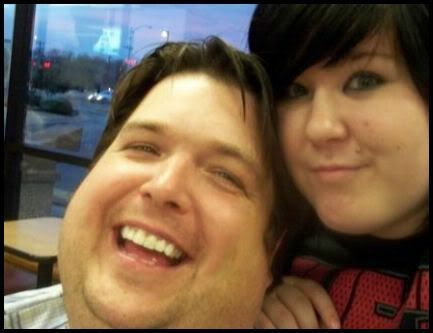 My dinner out with Kenz Thursday night. We also enjoyed some deep fried pickles!!! I wonder if the sodium messed with my numbers Friday?? Whatever...it's all good! 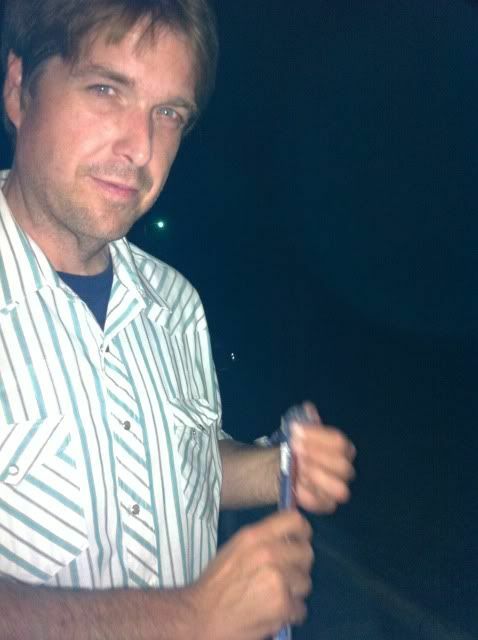 Recent picture--Lighting a Roman candle out in the country!! Breakfast is something that just can't be compromised. It can be abbreviated, simplified, grabbed on the run, whatever, but it is imperative--everyday. Even when I'm running late, breakfast is a top priority. I was never a "breakfast person" at my heaviest, and if I did grab something back then, it was usually a load of junk. Little chocolate donuts, some powdered too (in the name of variety), maybe some Doritos, and a big Dutch chocolate milk--sometimes the quart size...Oh, and are those deep fried cinnamon rolls? Sure, throw one (or two) of those in the bag! Breakfast is very different for me now and more important than ever. The first calories of the day are spent now, knowing what a favor I'm doing for my metabolism. If coffee is what I need to get me moving, a good breakfast is what my metabolism needs to start burning. I was running behind Monday morning, which isn't unusual for me, unfortunately...and I found myself in a fast food drive-thru for breakfast. This wasn't a bad situation, it could have been--sure, but I know that what makes anything bad or good--ultimately---comes down to my choices. My choice in this moment: A simple order of scrambled eggs and a banana. It isn't your typical fast food breakfast order, and you will not find it on their menu as a breakfast combo, but it is available--all I had to do was order what I wanted. What I wanted was a good breakfast, and that's exactly what I had Monday morning. Early afternoon found Me on the road to Tulsa. I was on the way to Sherri and Terry's home. Sherri is my cousin, Terry is her husband--they're family--very good people. Sherri is helping me manage my ideas and professional desires and seriously, I couldn't find anyone better to have in my corner. I planned on arriving in Tulsa with a business meeting at 3pm, followed by dinner and shopping! 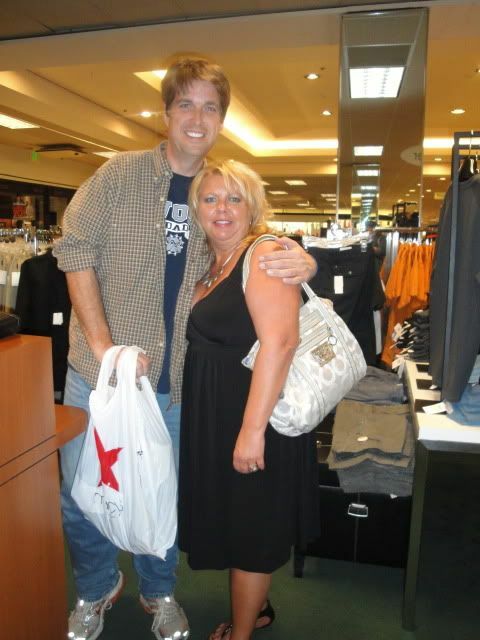 You see, a while back---I think it was when I posted the red high heel photos (fundraiser for Domestic Violence of North Central Oklahoma), Sherri noticed how baggy my jeans were---and at that time, she told me that she would love to buy me a pair of jeans someday that actually fit correctly. Well, tonight was the night! I purchased a pair of 36-30 jeans on Sunday, even posting the picture of the tab here, but of course I couldn't believe that I was really a size 36 waist. I mean really, me? Surely it was just the Levi Jeans company---maybe their size 36 was actually 38 or 40. Tonight at Macy's, I experienced some confirmation of my new jean size. 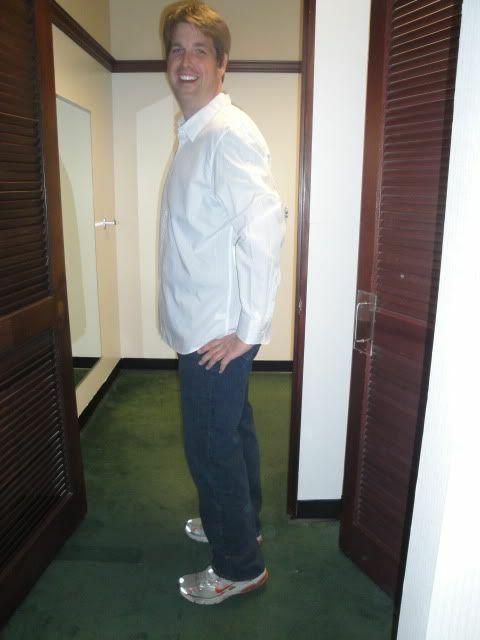 I tried on some 36-32's--Tommy Hillfiger---Uh, they fit---perfectly. (It turns out that I needed a 32 inseam all along and can even use a 34) I settled on a pair of Nautica--size 36 waist with a 32 inch inseam. Wow---these jeans feel amazing!!!! Oh Sherri, you didn't have to be so kind, but I thank you from the bottom of my heart! 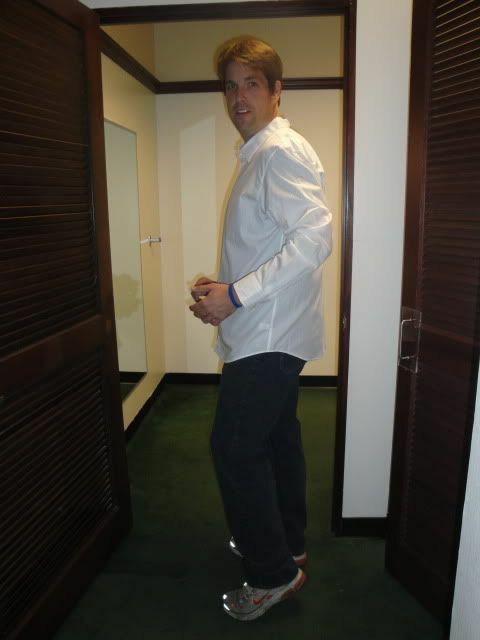 I needed these jeans to cement in my mind a size, a size that sounds crazy to me---so unbelievable that it's mine---so far from the old Sean, squeezing into size 64's. 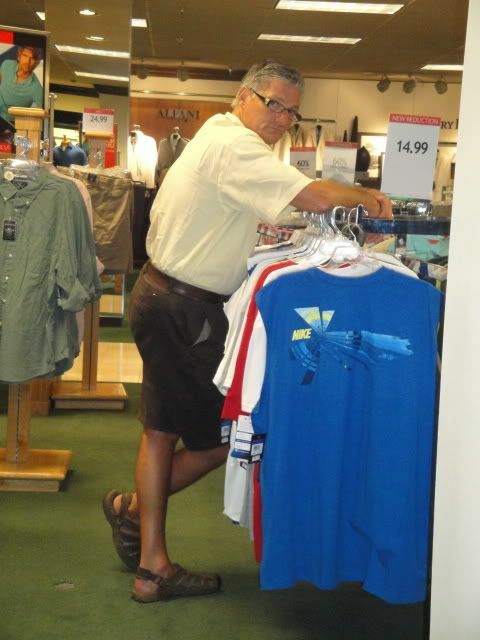 My Aunt Margaret (Sherri's mom) bought me a shirt, and that was another amazing experience in the fitting room. Many of the extra large shirts were too big. Seriously, let me type that again---Many of the XL shirts were too big. Wow, really? Yes, really. At the same time--many of the large shirts were just a tad too small. I'm between an "L" and an "XL," and I'm right in the middle of being thrilled. Thank you to Sherri and Aunt Margaret for the wonderful gifts. I've never enjoyed a fitting room in a store quite this much, ever in my life. I decided on a late night walk/jog/old fashioned foot race for a workout tonight. It takes me back to my very early childhood. Every time I do it, a sprint, I'm transported back to my childhood---P.E. class, and Mrs. Brown with a stopwatch---everyone lining up and running as fast as we could. I hated it back then, because I was always the slowest. I love doing it now, simply because I can. It's not about the speed or winning a race---it's about the feeling of accelerating my body under my own power---the feeling of a runner, and realizing that it doesn't hurt---in fact, it releases an amazing feeling in me that makes me feel euphoric for a little while. Endorphins are amazing little things my friend, just incredible really. Tuesday morning the counter was set. Terry was up early preparing the arena--The omelet cooking showdown was on! The ingredients were chopped and ready, the pans were in position, and we were off! His technique was amazing---and something I must try. Instead of folding it over, Terry finishes the omelet under the broiler...wow, it looked absolutely amazing. Now I'm upset with myself for not taking a picture of his omelet creation. It was absolute perfection. I was schooled. And really, we learned from each other...which was the point in the first place. We all gathered outside on the patio for a fantastic breakfast--It was perfect in so many ways. My mid-day speaking engagement at the Broken Arrow Business Women's Association meeting was a phenomenal experience for me. Not only was Sherri, Terry, and My aunt Margaret in attendance---Cathy was too! 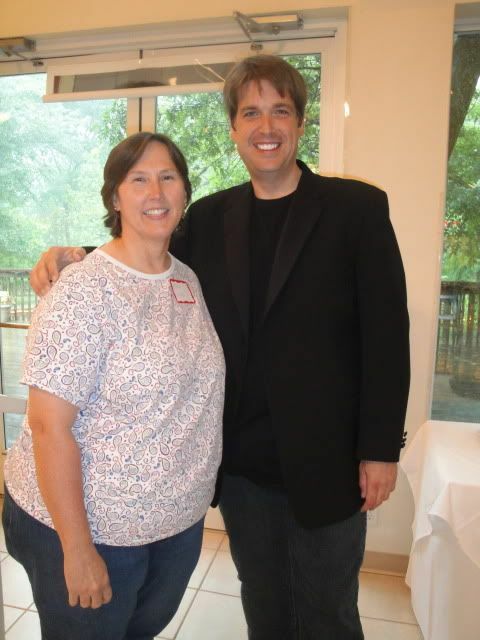 I met Cathy, a regular reader of this blog (picture below), who told me that when she realized that she was only a mile away--she just couldn't pass up the chance. 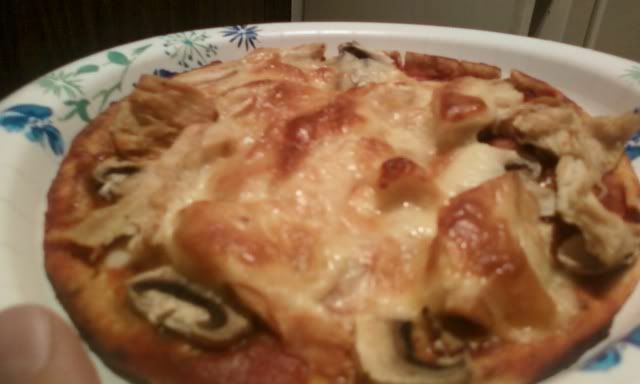 The menu was lasagna (loved it! ), salad (no--I didn't eat salad---you know me), broccoli (uh-no..;), bread, and brownies. I don't normally like to eat before a speaking engagement, but I made an exception here---enjoying a half a piece of lasagna and a half a slice of bread before taking the floor. I was very happy with my presentation. I was well prepared and completely confident in the structure of my message. The toughest thing for me is realizing that I can't say everything I really want to say--there isn't enough time. 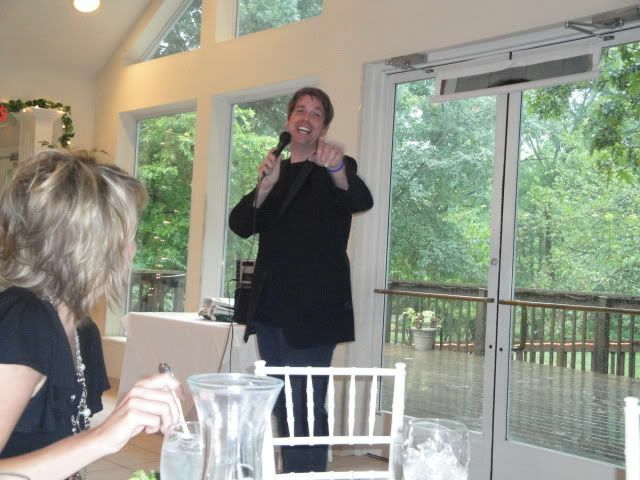 I must remember---this isn't a full blown weight loss seminar---it's a 30 to 35 minute speaking engagement. I was very pleased with the impact of my message. I could tell that people were listening intently and feeling the range of emotions that confirm the effectiveness of my communication---and that's exactly what I wanted to accomplish. 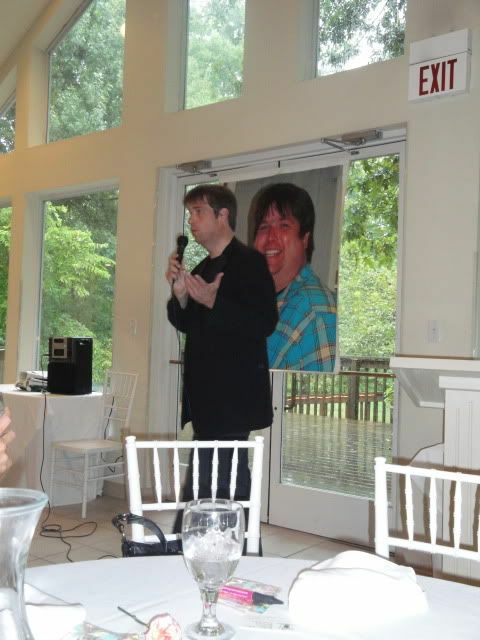 What a relief that it went well...seriously, I was "replacing" a successful contestant from NBC's Biggest Loser program. Yeah---I know!! When Danny Cahill's (not sure if that's how he spells his name) schedule no longer fit for this event, that's when I was contacted to speak. So--there's a little pressure---but seriously, none felt really---I'm more than confident with who I am, where I've been, where I am, where I'm headed, and my ability to communicate effectively...so really...no worries. 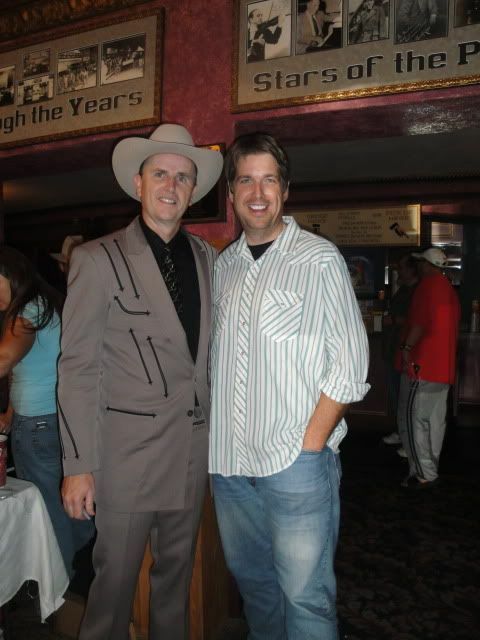 I don't have the "Biggest Loser" element of celebrity like Danny--But I certainly didn't need it today, or ever. 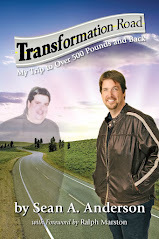 My story and my weight loss philosophy was everything I needed and more. Wednesday was a day that refused to stop. From my morning show at 6am to my broadcast from a casino in the evening---I finally arrived home by 8pm. I prepared a couple of pita pizzas for dinner and had a good talk with a loved one...then, because I refused to believe how tired I actually was--fell asleep in my recliner and slept all night. I hate it when I do that...Uhhhggg!! ...From the very beginning, I knew that if this time was really going to be the last, if it was really going to be different, I had to analyze my past failed attempts. One key flaw was that I never really gave this journey the importance level it deserved. When I felt that crazy unexplained urge to binge, I would always rationalize my way into feeling OK about “letting loose” a little. I would binge and then rarely ever be back on track in a solid way. Binging was no longer an acceptable thing this time. When those crazy thoughts would come---I would have to be honest enough with myself to recognize the danger threatening my journey. It's a real war inside the brain. But I had given this journey the utmost of importance in my life, and if I binge---it's going to surely be ripped away from me. I couldn't let that happen. This is too important. So I fought those crazy thoughts---I beat them down. Just tonight I commented a struggling friend and suggested this: Whenever something is threatening your journey---anything really---a thought, a circumstance, an emotion, an unexplained yearning---whatever it is---treat it like it's an intruder trying to kidnap one of your kids. Treat it like it's someone trying to kill you. If either one of those situations were happening, you would fight to the death to defend your family and yourself. Make your journey that important. Because it really is. You have to be strict with yourself. A gradual decline in your resolve can eat away at your journey slowly---with equally deadly consequences. Defend it with everything. Don't let anything steal this away from you. My level of strictness is equal to my desire to be successful on this mission. I want it and I want it bad, and I know myself better than anyone, I know that if I give myself an inch, I'll eat the whole thing. I feel like this is training for a healthier lifestyle. I'm training myself to understand food better, to discover flavors, to understand proper portion amounts, to really better understand exercise and nutrition benefits, I'm in training for a healthier, longer, more satisfying life. And I have to do it on the straight and narrow. When I put my head on that pillow I have to feel good about my calorie and exercise performance. And when you feel good about what you're doing, your confidence goes way up, your results start to add up, and you'll never be kept up by guilt. Guilt makes us feel bad about ourselves and that's when we're the most vulnerable to temptation, and I understand how that can snowball into a complete crash. I'm keeping it between the lines. Fitting room fun at Macy's in Tulsa...The idea of shopping in a "regular" store and wearing "regular" sizes isn't just an "idea" anymore. It's a beautiful reality...and one that I still can't believe. Terry--waiting while we all shopped and I made a mess of the fitting room. Terry is the best, just like me really---My natural inclination is to get in and out in record time...I'm not much of a shopper really---I think Terry and I have that in common. 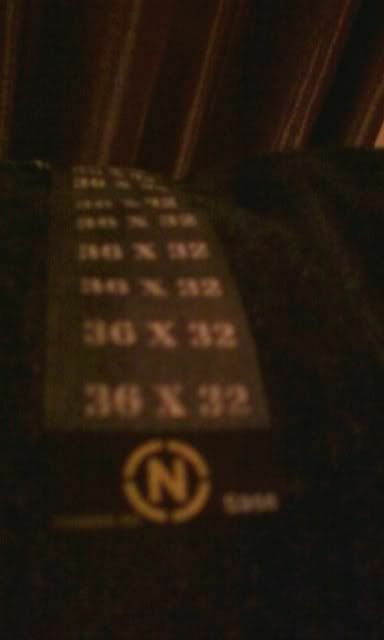 The size sticker on these new Nautica Jeans. I'm so happy and proud of this sticker...would it be bad if I just left it on the pant leg---and when someone mentions it, I can pretend I didn't notice.."Oh really--wow, silly me---what is that, 36-32, what does that mean? Oh, it's my size, yes...I feel so silly, thank you for pointing that out!" My Tuesday morning breakfast. 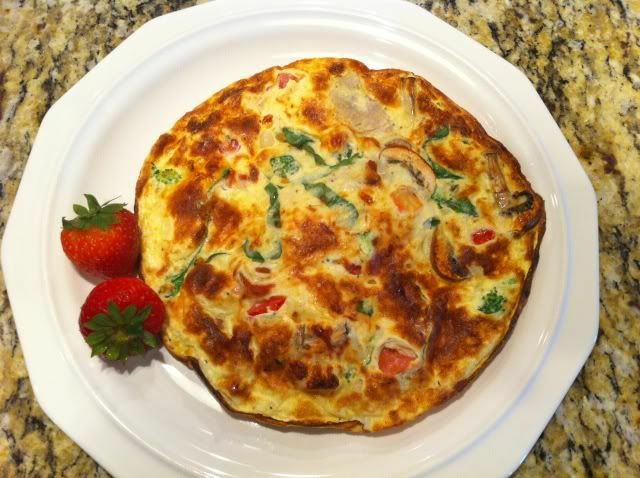 A veggie and cheese omelet made with two egg whites and a whole egg, fresh veggies, and a 50 calorie slice of mozzarella---a beautifully filling omelet and only 165 calories! A banana and a couple of strawberries, plus coffee---and great company--made this an absolutely amazing breakfast. With regular reader Cathy! It was absolutely my pleasure to meet you Cathy!! I'm so glad you were able to make this mid-day event!! 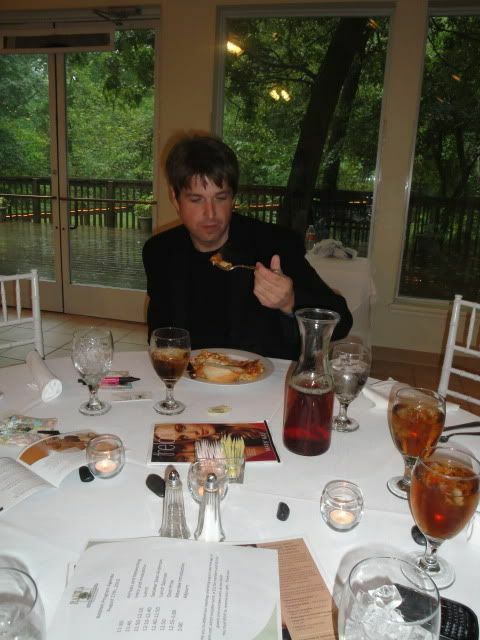 Enjoying my lasagna lunch right before speaking. 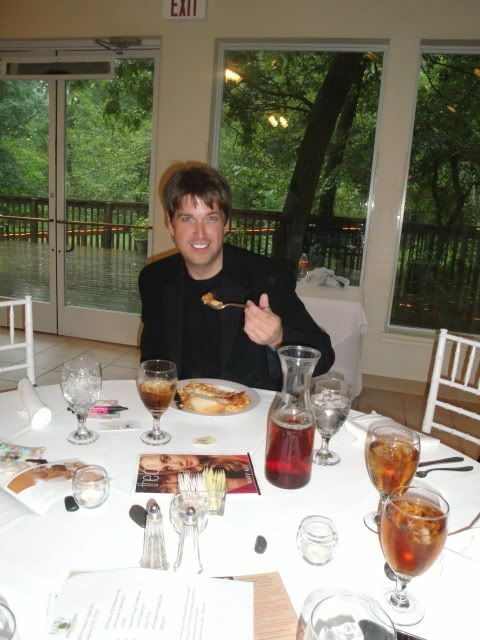 It's fitting to my weight loss approach and philosophy--that I'm eating lasagna minutes before speaking about my weight loss transformation. It was an awesome experience, an honor---absolutely! To speak, write, and effectively communicate my passion about weight loss and this entire transformation road is a dream come true. And I hope someone in that audience, even one person---realized that they have the power within them too. 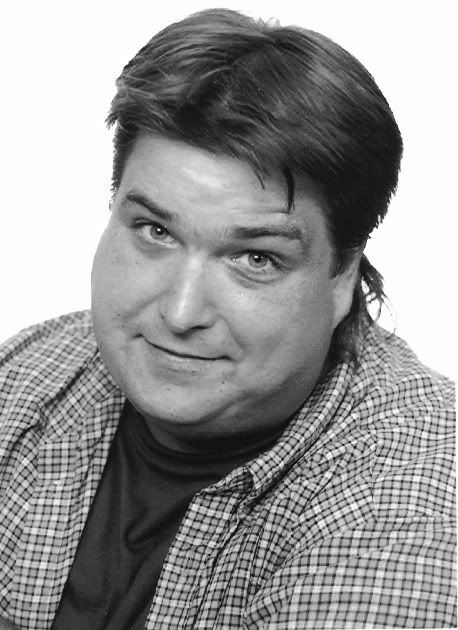 I'm no different--I struggled near, at, or above 500 pounds for nearly two decades. Each of us holds the key to our individual freedom---we have the power to choose change before change chooses us.